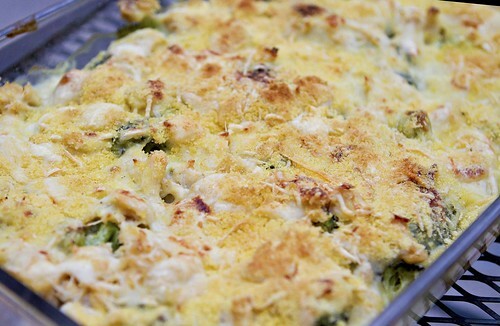 Chicken divan is one of my favorite dishes. It has broccoli and it's creamy, two of my very favorite things. Since we are trying to eat healthier around here, I was thrilled to see this recipe for a lighter version of it in All You magazine. It came out surprisingly delicious and even the kids loved it! I served it over some quinoa instead of rice. 1. Bring a large pot of water to a boil. Add broccoli and blanch 3 minutes. Drain and rinse with cold water to stop cooking. 2. Preheat oven to 350°F. Mist a 9-by-13-inch baking dish with cooking spray. 3. Season chicken with salt and pepper. Mist a large skillet or grill pan with cooking spray; place over medium-low heat. Cook chicken, turning once, until browned and almost cooked through, about 10 minutes. Remove from heat; transfer chicken to a cutting board. When cool, slice chicken into bite-size pieces. 4. Warm a medium skillet over medium heat. Add butter and 2 tsp. oil; heat until butter has melted. Add garlic and shallots and sauté until tender, about 3 minutes. Sprinkle flour over mixture and whisk until incorporated. Stir in broth, milk and sherry and bring to a boil. Remove from heat and stir in half of Swiss cheese. Season with salt and pepper. 6. Bake for 30 minutes or until browned on top; serve hot.